Golf was the entree to a freer world for this Afghan girl. We hear a lot of stories about disadvantaged kids who rise above their circumstances by becoming stars — at sports, say, or ballet. But sometimes the reason those pursuits mark a turning point is simply that they open up a different world. They show the kid that there are different worlds. The kids don’t have to become stars to benefit. Here is a story about an Afghan girl whose path to breaking free involved golf. Martin Kessler tells the story at the radio show Only a Game. “Before it was her turn to take the shot that could change her life, Shagufa Habibi remembers being uncomfortably warm. “Shagufa and 11 of her teammates were standing on a soccer pitch in Herat, Afghanistan. Herat doesn’t have a golf course, so this soccer pitch was the best her team could do. It was a summer afternoon — the hottest part of the day in a city where temperatures can exceed 100 degrees. It was the only time locals would let the women have the field. “Shagufa wore a long black dress and a head scarf. She carried a wooden club. Shagufa amazed herself. Her shot was the best. “In 2001, the Taliban lost control of the government, and schools opened for girls. Shagufa’s friends started attending. But Shagufa’s father wouldn’t have it – he believed women belonged at home. Over the next few years, there were conflicts with Shagufa’s conservative father, an unwanted marriage to an older man, separation, depression, and a decision to embrace sports at school. Sports were so freeing. 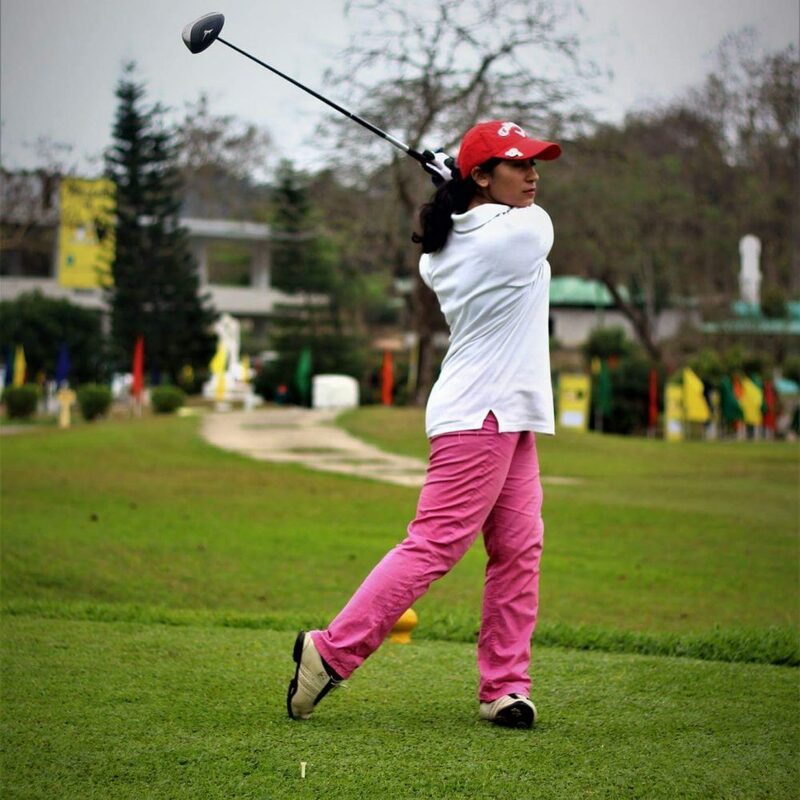 When Shagufa went to that golf tournament, she was “amazed by what she saw in Bangladesh. Girls weren’t wearing long dresses or scarves. She says women looked so free. “On the final day of the trip, the Afghan embassy hosted their players for a lunch. The conversation turned to education. Shagufa had a question – but she wasn’t sure she should speak up. Read what happened next at WBUR’s Only a Game, here. 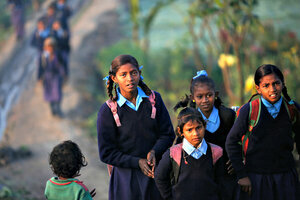 Schoolgirls make their way to their school on an early morning in New Delhi. Not long ago I read a story about boys in India who volunteer to help girls pursue education. The article by Astrid Zweynert and Ros Russell begins, “Boys campaigning for girls’ education is not common in most parts of the world, but in India’s Rajasthan state, they are at the heart of a drive to get more girls into schools. “Educate Girls trains young people to go into villages to find girls who are not in the classroom in a country where more than 3 million girls are out of school. “Some 60 percent of Educate Girls’ 4,500 volunteers are boys, founder and executive director Safeena Husain told the Thomson Reuters Foundation. I hardly need to remind readers of this blog that people are people. We are all just living our lives, with more or less the same daily concerns. And the differences are what make things interesting. Sam Radwany at the radio show Only a Game recently described some youthful experiences in Minneapolis that sound both the same and different. The story is about a group of American Muslim girls who choose to cover themselves in keeping with their kind of Islam but who are also enthusiastic basketball players. “The Twin Cities are home to one of the largest Somali populations in the world. The community is concentrated in the Cedar-Riverside neighborhood of Minneapolis, where these pre-teen players go to school. … Balancing their cultural and religious standards of modesty with sports can be tricky. “And because the girls’ team didn’t have their own jerseys, they had to share with the boys. Ten-year-old Amal says the experience was unpleasant. “That’s where a local nonprofit dedicated to expanding sports and recreation opportunities for local Muslim girls stepped in. … [They] brought in researchers and designers from the university to help the young athletes find a new solution to the stinky jersey problem. “And of course, with the young girls’ input, there’s a bit of color. Samira and Amal said the team had a lot of ideas.” Read about their design ideas and their delight in the uniforms here. Somali American girls in the Cedar-Riverside neighborhood of Minneapolis designed their own uniforms for greater freedom of movement.